100% 1:1 Digital Transfer from VHS Source - A/V Quality 7/10 - Best Available Transfer for this film! ----> Upgrade To Add Another Rare DVD to add * Raggedy Ann and Andy The Pumpkin Who Couldn't Smile 1979 * on DVD R ! ! DVD has full menu and chapters. 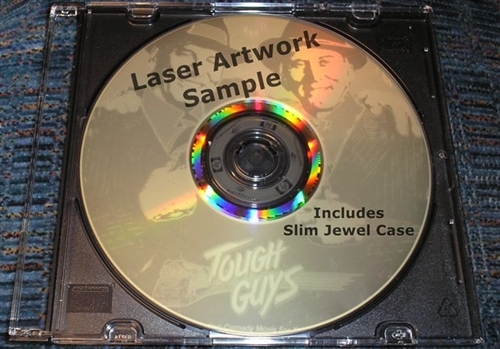 This DVD is a High Quality BACKUP of the BEST AVAILABLE source for this film onto DVD R. This title is very rare, out of print and has NO FUTURE RELEASE DATE pending. What on Earth happens when strange accidents begin to take place at the factory where Mr. Monroe works as a scientist. Vegetables are curiously drained of all their juices. The next door neighbors, as well as Harold the dog and Chester the cat, begin to suspect that the new found family bunny rabbit is really a vampire hare! This is a charming and kid friendly animated short film that is based on the classic Halloween children's book Bunnicula by James and Deborah Howe. 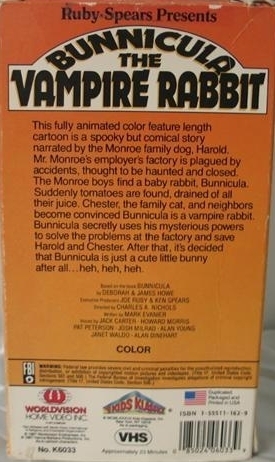 Bunnicula The Vampire Rabbit DVD is great fun for kids at Halloween. This was originally aired by ABC on TV as an animated short in 1982 for Halloween.